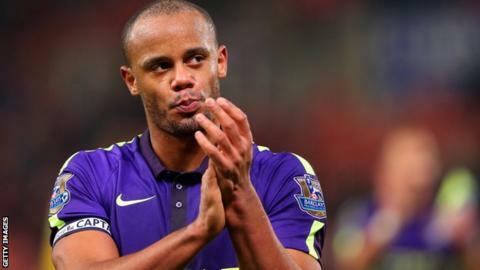 Manchester City captain Vincent Kompany says it is "a joke" that Uefa is investigating the club after fans booed the Champions League anthem. The incident took place before City's 2-1 home win over Sevilla on 21 October and European football's governing body later opened disciplinary proceedings. "There is nothing holy about the Champions League anthem," said Kompany. "We have played many games in Europe where there has been racial abuse - we have had to put up with it." City supporters are understood to have regularly booed the Champions League anthem over the past year. The Belgium defender, 29, added: "Uefa can do what they want to do, but in the end if people feel it's the right thing to do, they have the right to do it. "How else can they show their frustration and somehow have a voice that matters? "The fact that we were given the sanction is actually drawing more attention to what they are trying to do. We support our fans." Last year a City fans' group led a protest against European football's governing body after 650 CSKA Moscow supporters gained access to the Khimki Arena for their Champions League game, despite the Russian club being ordered to play it behind closed doors. Kompany added: "In Moscow we weren't allowed to have any support inside the stadium. I don't see what our fans did wrong." The case against Manchester City will be considered at a meeting of Uefa's disciplinary body on 19 November and a charge could follow.